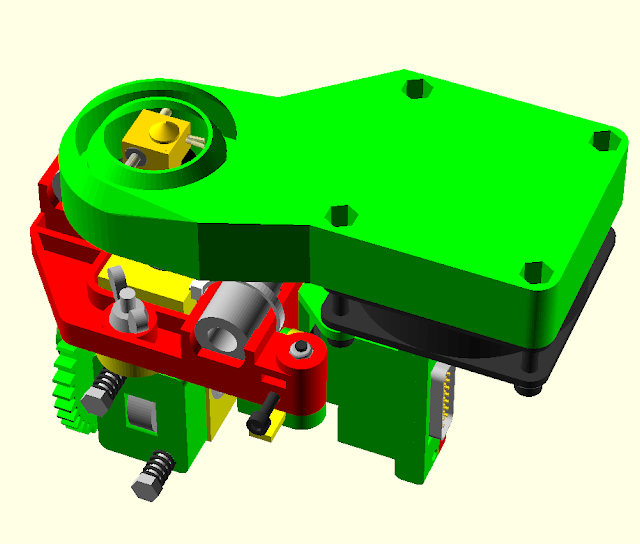 Has anybody tried to use an air pump to deliver air to the region of the extruder nozzle? The reason I ask is that I have almost finished my Rostock printer and am hoping to avoid having any extra weight of a fan on the print head. Air delivered through a thin walled silicone tube to precisely where it is wanted should fit the bill. Additional info: 40mm fans deliver about 60L/min of air, but when it is directed through even a small restriction this falls to about nothing. A 60L/min positive displacement pump will still deliver about 60L/min against a back pressure of 1psi. My thoughts are that it can also be very precisely delivered, perhaps through an annular jet around the nozzle, or through a flood jet further from the nozzle. Additional advantage is that air expanding from the nozzle cools down, giving more cooling per unit flow. Disadvantage is that back pressure in the silicone tube will try to straightne the tube, adding additional destabilising forces to the print head. The workshop instructor I am working with has implemented a similar system with a little blower fan like this one on the workshop's Mendel90. It works reasonably well (we only used it for PLA), however, the silicone tubing degraded over time due to the hot end's heat; this was mainly because he placed the tube right next to the hot end, though. Yeah, I also had my troubles to locate a decent (online) vendor. Ebay seemed like the only option (this is also where the workshop instructor got his fans from). In the end, I settled for axial fans, but have not equipped my printer with any since runs pretty well without any cooling. I am printing mainly ABS, though. What sort of size pipe are you thinking of? I was thinking of a printed hood-like contraption similar to Nophead's fan duct, but with the fan sucking the air in and running it through an activated carbon filter instead of blowing. Theoretically, the air flow around the nozzle should contribute to cooling with the added benefit of removing ABS fumes. The 1.75mm filament is already much nicer in this respect than the 3mm, so my "minimal air cleaner" might work. like 978-109BC12GC7-1 on mouser.com ? For equivalent size and price, you can find high speed frontal fans with better air flow in a ratio of 3x or 4x. But it is true that such blowers are not as much impeached by backpressure, so YMMV. And blowers tends to be noisy. @ugen, look into a portable vacuum like those sold at computer stores or for an automobile. They'd probably be right up the alley for fume extraction in a small diameter profile, although as has been pointed out, there will be a noise cost. (you can put the device into an insulated box though, which would help. I ran a shop vac to draw residual material off a PCB milling machine...got very loud. I have got the 50x50 $18 blower from the first eBay link, that I use to cool down my aquarium stand and it makes a a lot of noise and blows a lot of air, probably much more air than it is necessary to cool the extruder. The $3 bucks one looks like a nice alternative. Also, have you considered and air pump for aquariums? I've tried an aquarium air pump, it was a fairly nice on too. It didn't put out enough air pressure, so if you do go that route make sure you get a fairly good sized one. I'm not sure what they rating is on mine but it was fairly expensive for an aquarium air pump. They are not made to put out much pressure cause it doesn't take much to oxygenate water. Just FYI. Lazzymonk asked what size tube I wanted to use. At the moment I don't know, only a gut feeling that it should be as thin as practical so that it was both flexible and the bourden tube effect (where pressure tries to straighten the tube) will be minimised. My experiance with cooling is that you should us enough to cool the extruded plastic so that it stops moving - but no more. My present Prusa printer has a hot end and fan of my own design. The heated block has a PEEK cover which has very square edges and is in the blast of a ducted fan. The idea is that the turbulence around the block should get cooling air everywhere close to the nozzle. This seems to work very well at very low flows - I drive my 12V fan at 2.8 to 4 volts; any more and the part that I am printing will lift at the edges, any less and corners lose definition. My thumb in the air guess is that I will need about 10L/min of air and that it will need about 1psi to push this through an 8mm dia thin walled silicone tube to two nozzles - maybe with something to introduce a bit of turbulence into the air flow. I am starting to do some trials on this idea, It looks like 10L/min is still too far much flow. At the moment I am trying to measure the local flow with a self heated thermistor to get a value of cooling that is about the same as I get from a fan that I know does a good job. 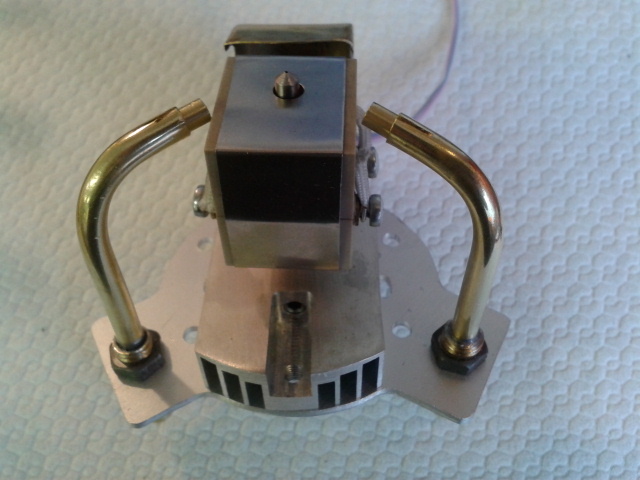 I am using the exhaust air from a fan cooling the heatsink on my hot end for some background cooling with two brass tubes directing air towards the tip of the hot nozzle. 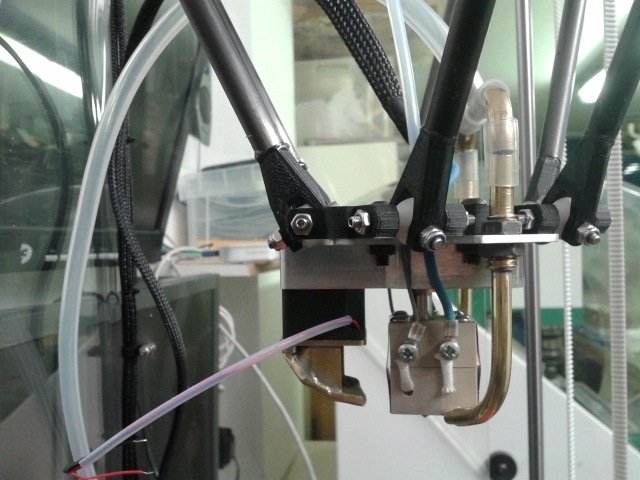 Some early ( totally non-rigorous) trials show that only a very small amount of cooling will be needed if it is directly closely enough to the area of the newly extruded plastic. 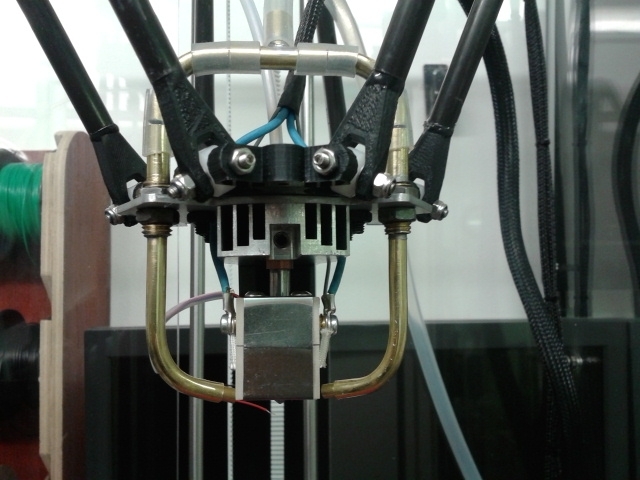 Too much cooling has the effect of not only lifting the work piece from the heated bed, but also weakening the bond between the body of the plastic and the newly extruded layer. 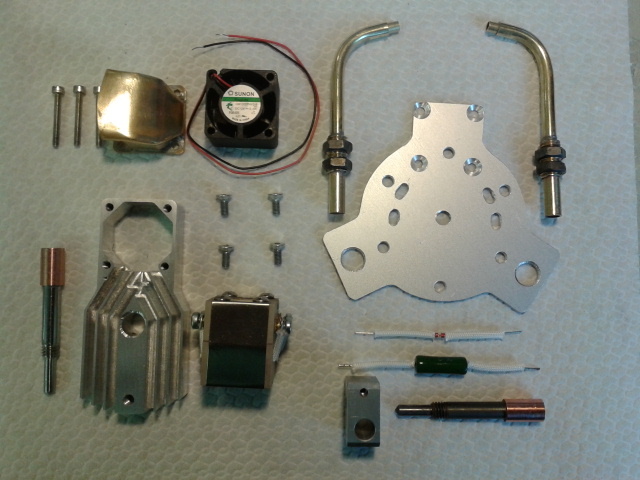 Pictures show the parts including the cowl for the heatsink fan and the brass tubes for the pumped air, The complete hot end assembly with the tubes in place and two views of this fitted to a Rostock carriage. I had something like this in the past. It worked ok using a radial blower fan down 20mm flexible ducting, but placing a shrouded fan on my X carriage works better. The thing you want is CFM, not PSI. To understand the difference, try inflating an air mattress with a tire compresor. You would assume if it will blow up a tire..... The mattress inflator wich uses about the same power is 20 times quicker at the task than the compressor because it moves a lot more air. Aquarium pumps do not move as much air as a fan. Pressure is not needed to carry off heat. For this you need volume. basically you need a blower fan, then print a nozzle for it to send air through the tube. the tube should be ptfe. The problem that I am working on is that you only need cooling to stop the plastic from flowing, surface tension pulls out the fine detail of the model. The cooling should be no more than absolutely necessary - and applied locally.. Even 1 CFM is likely to be much more than needed. Any tube with a pressure inside tries to straighten itself and larger diameters make it stiffer - so small diameter with a positive displacement pump is needed. PTFE is stiffer than silicone. yeah but they use ptfe to feed the filament to the extruder, it should be flexible enough to go to the extruder and then some sort of nozzle. The tube for the filament is only 2mm bore - too small to carry the even the small amount of air that I think is needed. Also, PTFE is more expensive than silicone. Edited 1 time(s). Last edit at 04/06/2013 06:16AM by leadinglights. I found a 7 ft section still new of PTFE tubing for a $1 at goodwill. lol cant beat that.